Tandoori Naan is an authentic Indian Flatbread, baked in a tandoor oven - Tandoori Naan. 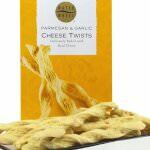 A naan is somewhat similar to a Pita bread and is great when eaten warm. 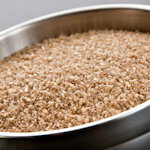 This is a whole grain variety of the original. Heat the naan in an oven, in a microwave or in a non-stick skillet and spread with butter or olive oil and serve and eat immediately. 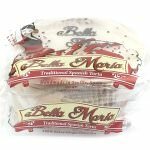 You can also use them in many recipes: a pizza crust, an alternative dinner roll, sandwich or wrap and of course, for your favorite dips. 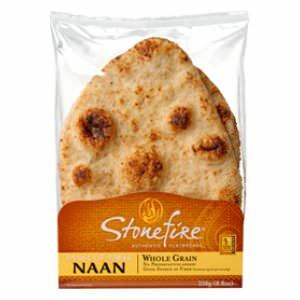 In May 2010 Women's Health Magazine Named the Whole Grain Naan one of the 125 Best Packaged Foods for Women in the US. It is great that health care professionals and consumers realize that packaged foods can be wholesome, nutrient-dense and tasty! 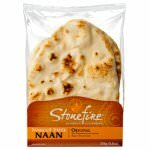 The makers of these Stonefire Naan see themselves as Adventurers in Great Taste and that is exactly what you will experience when you eat the Tandoori Naan.